HOW DRY I AM Ultra brut sparkling wine is the driest of the dry. This holiday season, we're taking it down a notch. Brut? That's yesterday's dry. Extra dry? That's a category of sparkling wine that's actually sweeter than brut, possibly designed to confuse the credulous. This year, we're going "ultra brut." Also called "extra brut" and "brut nature," this is a style of sparkling wine with a whiff of the fresh breeze to the moniker. Virtually unadorned by sugary ornament, it stands alone in its natural state, proudly facing the winds of consumer trends. Most sparkling wine has a syrupy slug (the dosage) added to it after disgorgement, when the dead yeast is removed from the bottle. In the brut style, it barely balances the acidity—less than 12 grams of sugar per liter. An ultra brut (less than six grams, or 0.6 percent) can only be produced under special conditions. Scott Anderson, associate winemaker with J Vineyards, explains that they first began work on J's Cuvée XB in 2012. It was a blend of the 2011 vintage with a portion of reserve wines stored in the winery's big, oak barrels. "We found we had a wine that had a nice mouthfeel," says Anderson, "and that's what you really need for one of these—a dry sparkling wine with some oomph behind it, without needing extra dosage sugar." Anderson says that they tabled the experiment for a year before coming back to it in 2013. "It's the same wine—we just left it for an extra year on the yeast and—lo and behold—it worked out really well." 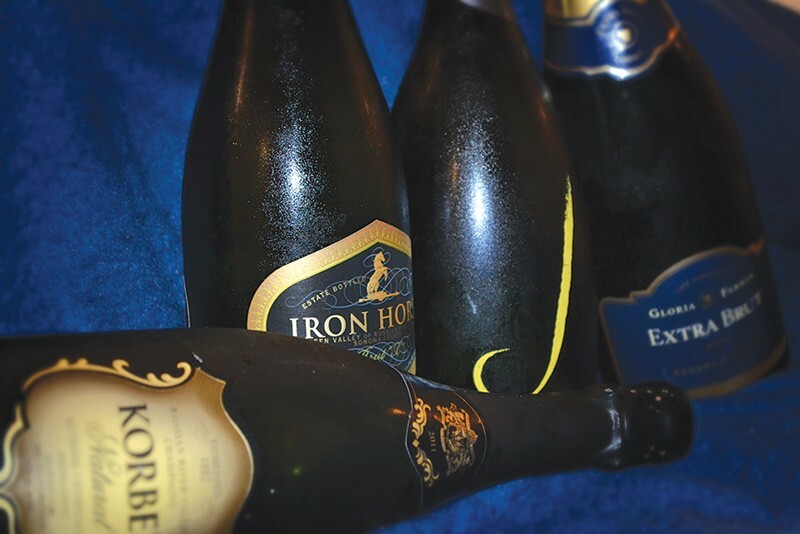 For this year's sparkling wine holiday edition of Swirl, I put the ultra brut challenge to Bohemian staff, fully anticipating that they might reject these carefully made wines in a blind tasting, because they're too stripped-down for most palates. But it turns out that the ultra brut is not to be underestimated. Wines are listed in order of the panels' overall preference; stars awarded from one to five by me—adjustments by no more than one-half point after retasting.